Cordillera Administrative Region (Ilokano: Rehion/Deppaar Administratibo ti Kordiliera; Tagalog: Rehiyong Pampangasiwaan ng Cordillera), designated as CAR, is an administrative region in the Philippines situated within the island of Luzon. The only landlocked region in the country, it is bordered by the Ilocos Region in the west and southwest, and by the Cagayan Valley on the north, east, and southeast. Prior to the 2015 census, it is the least populated and least densely-populated Region in the country. The region comprises six provinces: Abra, Apayao, Benguet, Ifugao, Kalinga and Mountain Province. The regional center is the highly urbanized city of Baguio. The region, officially created on July 15, 1987, covers most of the Cordillera Central mountains of Luzon, and is home to numerous ethnic people collectively. Nueva Vizcaya province has a majority-Igorot population as well, however, was put by the American colonial government in the early 20th century in Cagayan Valley region instead. During the Spanish occupation of the Philippines, Christianization and eventual subjugation of the mountain region proved difficult for the Spanish colonial government. Several comandancias were established by the Spanish colonial government in strategic areas of the mountain region. Among them were Amburayan, Cabugaoan, Kayapa, Quiangan, Itaves, Apayaos, Lepanto, Benguet, Bontoc, Banaue, and Tiagan. On August 18, 1908 during the American regime, Mountain Province was established by the Philippine Commission with the enactment of Act No. 1876. Ifugao, which was part of Nueva Vizcaya province, and the former Spanish comandancias of Amburayan, Apayao, Benguet, Bontoc, Kalinga and Lepanto, were annexed to the newly created province as sub-provinces. Amburayan was later abolished in 1920 and its corresponding territories were transferred to the provinces of Ilocos Sur and La Union. Lepanto was also reduced in size and its towns were integrated into the sub-provinces of Bontoc and Benguet, and to the province of Ilocos Sur. On June 18, 1966, Republic Act No. 4695 was enacted to split Mountain Province and create four separate and independent provinces namely Benguet, Ifugao, Kalinga-Apayao, and Mountain Province. Ifugao and Kalinga-Apayao were placed under the jurisdiction of the Cagayan Valley region, with Benguet and Mountain Province placed under the Ilocos Region. 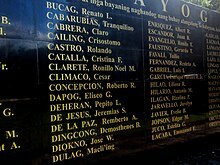 Detail of the Wall of Remembrance at the Bantayog ng mga Bayani in Quezon City, showing names from the first batch of Bantayog Honorees, including that of Macli-ing Dulag. After the declaration of Martial law by Ferdinand Marcos in 1972, the region became the focus of militarization as a result of local objections to the government's push for the Chico River Dam Project near Sadanga, Mountain Province and Tinglayan, Kalinga. Frustrated by the project delays caused by the opposition, Ferdinand Marcos issued Presidential Decree no. 848 on December 1975, constituting the municipalities of Lubuagan, Tinglayan, Tanudan, and Pasil into a "Kalinga Special Development Region" (KSDR), in an effort to neutralize opposition to the Chico IV dam. Empowered by Martial Law to conduct warrantless arrests, the 60th PC Brigade had arrested at least 150 locals by April 1977, accusing them of supposed subversion and of obstructing government projects, and various other offenses such as boycotting the October 1976 Constitutional Referendum. Individuals arrested included tribal papangat (leaders/elders), young couples, and in at least one case, a 12-year-old child. (p9) By December 1978, parts of the Chico IV area had been declared "free fire zones", no-man's-land areas where the army could freely fire on any animals or permit-less humans at will. On 24 April 1980, Marcos-controlled military forces assassinated Macli-ing Dulag a pangat (leader) of the Butbut tribe of Kalinga. The assassination became a watershed moment, marking the first time the mainstream Philippine press could be openly critical against Marcos and the Military, and building up a sense of Igorot identity which eventually led to cordillera autonomy. On July 15, 1987, President Corazon C. Aquino issued Executive Order 220 which created the Cordillera Administrative Region. The provinces of Abra, Benguet and Mountain Province (of the Ilocos Region), and Ifugao and Kalinga-Apayao (of the Cagayan Valley) were annexed as part of the newly created region. Nueva Viscaya was not included in the region despite having an Igorot majority at the time. Several attempts at legalizing autonomy in the Cordillera region have failed in two separate plebiscites. An affirmative vote for the law on regional autonomy is a precondition by the 1987 Philippine Constitution to give the region autonomy in self-governance much like the Autonomous Region of Muslim Mindanao in southern Philippines. The first law Republic Act No. 6766, took effect on October 23, 1989 but failed to muster a majority vote in the plebiscite on January 30, 1990. The second law, Republic Act No. 8438 passed by Congress of the Philippines on December 22, 1997, also failed to pass the approval of the Cordillera peoples in a region-wide referendum on March 7, 1998. At present, a third organic act of the Cordillera is in the offing supported by the Cordillera Regional Development Council. In September 2000, the municipal council of Itogon, Benguet, withdrew support for the San Roque Dam project. The project had met a lot of resistance, because of the reported failure of its proponents to update its Environmental Certificate of Compliance (ECC) and to submit a watershed management plan required for a project of that magnitude. The San Roque Dam was to become one of the biggest dams in the world and would threaten the living environment of the Igorot. The Cordillera Peoples Alliance (CPA), an indigenous rights organization in the region, in co-operation with other organizations, had highly resisted this project and thus booked a little victory. However, in May 2001, president Arroyo declared that the San Roque Dam project would continue anyway because it had already started and therefore was difficult to stop. At the same time she promised to not sacrifice the environment, to resettle the people who will lose their houses, to compensate other people, and to initiate no other large-scale irrigation projects in the future. In December 2000, the Supreme Court of the Philippines dismissed a petition that questioned the constitutional legality of the Indigenous Peoples Rights Act (IPRA), and act which came into existence in 1997 giving the peoples of the Cordillera decisive influence over the establishment of foreign mining companies. In this act, ownership over the lands was regarded as communal, rather than individual and thus coincided more with the view on ownership of the Igorot. The IPRA was totally different in tone than the 1995 Mining Code. Without consultation from the people of the Cordilleras, the Mining Code gave companies the freedom to devastate tribal lands, allowed 100% foreign ownership, and gave companies the right to displace and resettle people within their concessionary areas. Some influential people filed a lawsuit with the Supreme Court against the IPRA, because it contradicted with the Mining Code and would therefore be unlawful. The petition was dismissed in a 7-7 vote by the Supreme Court. A bill creating an autonomous Cordillera was filed in Congress in 2014, but it was not backed by strategic politicians in the region due to lack of support from the national government. However, in 2017, all provincial congressmen within the CAR jointly filed a new Bill creating an autonomous Cordillera, the first time in three decades where all provincial district representatives called in unison for autonomy. The move was made due to the election win of President Duterte, who publicly supported the creation of an autonomous Cordillera. However, questions lingered on the issue of Nueva Viscaya's exclusion from the proposed region, despite being culturally and geographically part of the Cordilleras, leaving Nueva Viscaya Igorots left out from the proposal. The region is the only landlocked region in the Philippines, bounded on the northeast and east by the Cagayan Valley, and on the southwest and west by the Ilocos Region. The region is primarily mountainous, positioned in the Cordillera Central mountain range, which includes Mount Pulag, the highest mountain in Luzon. Cordillera Administrative Region is politically subdivided into 6 provinces. It has 2 cities; the highly urbanized city of Baguio, and the component city of Tabuk. There are 1,176 barangays in the region. Geographically, the western half of Nueva Viscaya is part of the main Cordilleras, while its eastern half is part of the Caraballos, the meeting point of the Cordilleras and the Sierra Madre. There have been moves to reunify Nueva Vizcaya with the Cordilleras, however, no such legislation has yet been introduced in Congress. † Baguio is a highly-urbanized city; figures are excluded from Benguet. Cordillera is home to many ethnic tribes living on the Cordillera mountain range. They are commonly referred to as the Igorot. The region has been called "the most diversified ethno-linguistic regionin the Philippines" with the many "sub-dialect variations" of its major languages. This diversity has been attributed to the mountainous topology of the region. However, this did not lead to variations in "cultural development", and the majority of the people share a "similar cultural identity". Balangao, spoken in Natonin, Mountain Province. Bontoc, spoken in Bontoc, Mountain Province. Ilocano, spoken in Apayao, Abra, Kalinga, Mountain Province, Benguet, and Ifugao. It is the regional lingua franca. Kalanguya, spoken in some parts of Benguet. Kankanaey, spoken in western Mountain Province and some parts of Benguet. Roman Catholic is the single largest denomination in this region. However unlike most other provinces and regions of the Philippines, they only form a slight majority in the region forming 60%-70% of the population while Protestants specifically Anglicans and Evangelicals have a very strong presence that forms 20%-30% of the population. Other religions such as traditional Animism have a significant presence in the region and it's mainly practiced by tribal people. The primary economic drivers are agriculture, mining, export processing, and tourism. The Cordillera region is known for its unique musical instruments including the gangsa kalinga, nose flute, bamboo flute, buzzer, bangibang, tongatong, diwdiw-as, saggeypo, and bamboo zither. ^ a b "Regional Profile: Cordillera Administrative Region (CAR)". CountrySTAT Philippines. Archived from the original on 22 October 2014. Retrieved 18 September 2014. ^ a b "Mt. Province". VisitMyPhilippines.com The Ultimate Travel Guide for Tourists. Department of Tourism. Retrieved 23 December 2013. ^ Keesing, Felix Maxwell; Keesing, Marie Margaret; Keesing, Marie Martin; Institute of Pacific Relations (contributor); International Research Committee (contributor) (1934). Taming Philippine Headhunters: A Study of Government and of Cultural Change in Northern Luzon. Stanford University Press. pp. 67–69. ISBN 9780804721103. Retrieved 2 January 2015. ^ "Benguet History". Province of Benguet (official website). Archived from the original on 19 October 2014. Retrieved 22 October 2014. Benguet was once part of Mountain Province. ^ "Historical Background". Provincial Government of Apayao. Archived from the original on 4 January 2015. Retrieved 3 January 2015. ^ Ingles, Raul Rafael (2008). 1908 :The Way it Really was : Historical Journal for the UP Centennial, 1908-2008. Diliman, Quezon City: University of the Philippines Press. pp. 330, 339. ISBN 9715425801. Retrieved 2 January 2015. ^ "Cordillera Administrative Region History". Cordillera Connection (Blogspot). 14 August 2009. Retrieved 22 October 2014. ^ "Republic Act No. 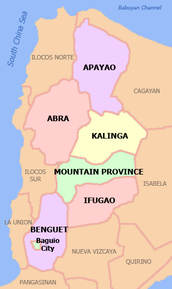 4695: An Act Creating the Provinces of Benguet, Mountain Province, Ifugao and Kalinga-Apayao". Chan Robles Virtual Law Library. Retrieved 18 September 2014. ^ "Facts & Figures: Ifugao Province". Philippine Statistics Authority - National Statistical Coordination Board. Department of the Interior and Local Government - Cordillera Administrative Region. Retrieved 2 January 2015. ^ "Historical Background". Provincial Government of Apayao. 15 April 2013. Archived from the original on 4 January 2015. Retrieved 3 January 2015. ^ "DULAG, Macli-ing – Bantayog ng mga Bayani". Bantayog ng mga Bayani. Bantayog Memorial Center. 2015-10-15. Retrieved 2017-09-23. ^ Doyo, Ma. Ceres P. (2015). Macli-ing Dulag: Kalinga Chief, Defender of the Cordillera. Diliman, Quezon City: University of the Philippines Press. ISBN 978-971-542-772-2. ^ Marcos, Ferdinand E. (1975-12-12). "Presidential Decree No 848 ONSTITUTING CERTAIN MUNICIPALITIES WITHIN THE PROVINCE OF KALINGA-APAYAO INTO A SPECIAL DEVELOPMENT REGION TO BE KNOWN AS KALINGA SPECIAL DEVELOPMENT REGION". CHAN ROBLES VIRTUAL LAW LIBRARY. Retrieved 2018-04-14. ^ Catajan, Maria Elena (2017-04-22). "Chico hydro project opposed". SunStar. Archived from the original on 2017-04-22. Retrieved 2018-04-14. ^ Aureus, Leonor J., ed. (1985). The Philippine Press Under Siege II. 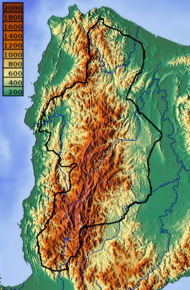 ^ "The Cordillera Administrative Region (CAR)". Department of Agriculture. Retrieved 18 September 2014. ^ "R.A. No. 7878: An Act Converting the Sub-Provinces of Kalinga and Apayao into Regular Provinces to be Known as the Province of Kalinga and the Province of Apayao, Amending for the Purpose Republic Act No. 4695". Chan Robles Virtual Law Library. 14 February 1995. Retrieved 4 January 2015. ^ "Facts & Figures: Apayao Province". Philippine Statistics Authority - National Statistical Coordination Board. 19 April 2012. Retrieved 4 January 2015. ^ a b c Ferrer, Miriam Coronel (4 September 2010). "Cordillera autonomy - Miriam Coronel Ferrer". ABS-CBN News. Retrieved 4 January 2015. ^ a b c "Cordillera Autonomy". Scribd Inc. Dona Dee Lacdao. Retrieved 4 January 2015. ^ "R.A. No. 6766: An Act Providing for an Organic Act for the Cordillera Autonomous Region". The LawPhil Project. Congress of the Philippines. Retrieved 4 January 2015. ^ "R.A. No. 8438: An Act to Establish the Cordillera Autonomous Region". The LawPhil Project. Congress of the Philippines. Retrieved 4 January 2015. ^ "Mayor Domogan optimistic on OK of Cordillera Autonomous Region bill with P75B investments". 2 July 2017. ^ Cordillera People's Alliance, Public Information Commission (1 January 2001). "Dams In the Cordillera" (PDF). International Rivers. Archived from the original (PDF) on 4 January 2015. Retrieved 4 January 2015. ^ "Cordillera's Water Resources". Cordillera Peoples Alliance. Retrieved 4 January 2015. ^ "Intriguing Patterns in Scolbert08's Map of Religion in Insular Southeast Asia". GeoCurrents. Retrieved 2017-12-06. ^ "Philippine Church National Summary". philchal.org. ^ a b "CAR - DOF – BUREAU OF LOCAL GOVERNMENT FINANCE". Wikimedia Commons has media related to Cordillera Administrative Region.